← I never turn down an opportunity to snuggle! Here’s me, Rachel, and my now 4 year old daughter in this pic. And, in case you can’t tell, I’m VERY pregnant in the picture. To be honest, I didn’t carry my daughter that much at this point, but she had been my one and only “baby” for the carrying for a long while and we were now getting ready to welcome daughter #2. Getting closer to the end of my pregnancy, my daughter brought me her “candy cane” wrap (Hoppediz Lille shorty) and asked to be carried. I think she was getting the idea that her wrapping days were getting shorter and shorter and new baby was about to “take over” the stash. Always happy for my big girl snuggles with my petite 30 lb. 4 year old, up she went in a rebozo carry in her “candy cane” wrap and we snagged a pic for memories. 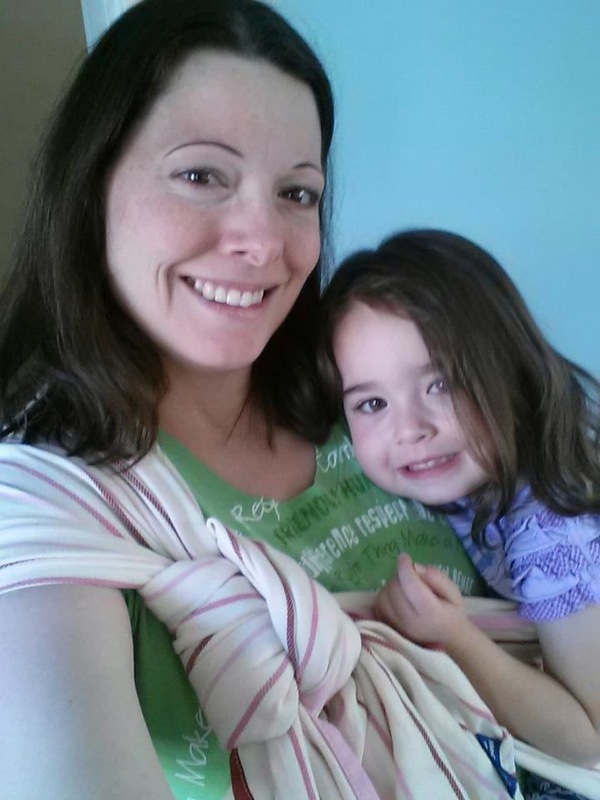 This is the last time my big girl was in a wrap, just the two of us.